Traditional knowledge discovery processes are applied in a biomedical population study to develop a data warehouse of diverse clinical, phenotypic, psychosocial, and genetic data associated with hypertension. Experiences of an informationist as a member of a biomedical research team are shared. Issues encountered with missing data and data analysis is discussed. 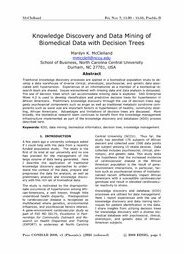 The use of decision trees which can accommodate missing data is explored. SAS Enterprise Miner 4.2 is used to develop classification and predictive decision trees for hypertension in African Americans. Preliminary knowledge discovery through the use of decision trees suggests psychosocial components such as anger as well as traditional metabolic syndrome components such as waist size are important factors in hypertension of healthy, community dwelling, African Americans. Advantages and limitations of decision trees are discussed. More broadly, the biomedical research team continues to benefit from the knowledge management infrastructure implemented as part of the knowledge discovery and databases (KDD) process described here.